How can we compete with countries like China that are making massive investments in new technology? Denmark is a small player in a global context when we compare ourselves with nations such as China, the United States and other big players that are investing large amounts in the development of new technologies such as artificial intelligence. How can we meet the challenge without the same number of digital experts at our disposal or without the same amount of startups as in Silicon Valley? Is part of the solution to create stronger links between research and industry? 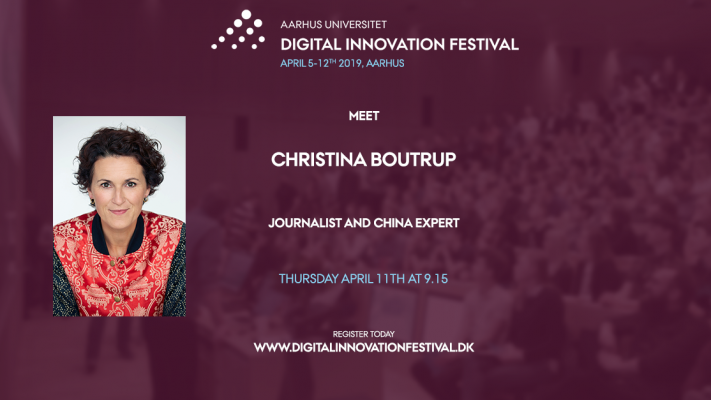 You can learn more when the China specialist and journalist, Christina Boutrup, gives a presentation at the AU Digital Innovation Festival on April 11 under the headline “Digital Innovation in a Competitive World and Large Research Projects”. and she has worked as a business journalist specialising on China for the past 15 years. In her speech, she will give a foretaste of how China is undergoing a massive tech revolution. The session also includes presentations by Head of Department and Professor Kaj Grønbæk from the Department of Computer Science at Aarhus University and Professor Peter Gorm Larsen from the Department of Engineering – both experienced project managers several major research projects with focus on collaboration with industry. Christiane Vejlø from the radio programme, Elektronista, will moderate the session. The Digital Innovation Festival is a new tech festival in Aarhus with workshops and conferences which will take place from 5 to 12 April. The festival celebrates digital innovation among researchers, students and companies, and it focuses on today’s most hyped technologies such as artificial intelligence, blockchain, microservices, AR, drones, cloud computing and Internet of Things. You can also meet the Oscar-winning researcher Henrik Wann Jensen, who was awarded a technical Oscar for rendering Gollum’s skin in Lord of the Rings. In addition, Nikolaj Sonne – known from the DR programme So ein Ding – will attend the conference with inspiration from the digital world. The week will conclude with Katrinebjerg Karrieredag (Kdag.au.dk) on April 12, which is one of Denmark’s largest career fairs within the IT industry.